First, we will take a long hard look at the design and color of the latest and greatest from adidas. Suffice it to say, it is unique. The odd paneling and colors make it look unlike anything that we have previously seen in the world of match balls. Unlike Nike, adidas have never claimed that their ball has been designed so that players can quickly ascertain the spin on the ball and the Brazuca pattern makes it looks crazy as it spins and flies through the air. Anyone that is familiar with the TeamGeist series from adidas will know that the ball always looked slightly small for a size five, and this is something that has come back around with the Brazuca. Although the recent outings from adidas (Cafusa, Tango, etc.) 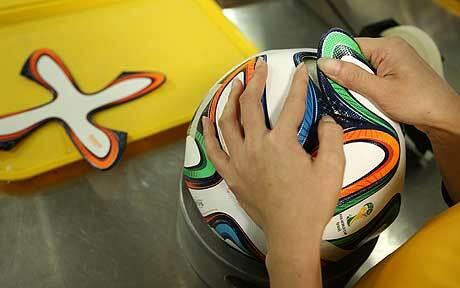 looked the proper size, the shape and bonding on the Brazuca (like the TeamGeist) makes it look slightly small. Do not worry that you have accidentally ordered a size four though, this is a size 5 top-tier match ball…it just looks small. Second, when playing with the ball, it performs as you would expect a high end match ball. The flight is true and there are no odd “Jabulani-like” movements. 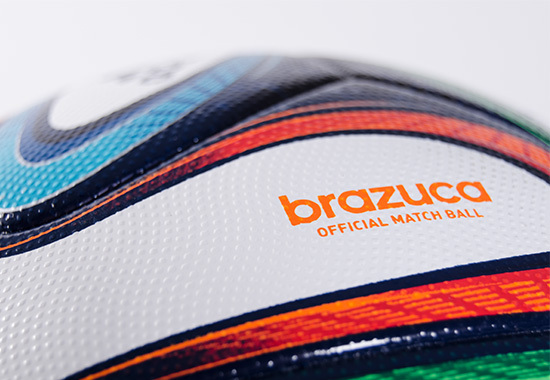 However, the Brazuca does seem to sail through the air a bit faster than other high-end balls. 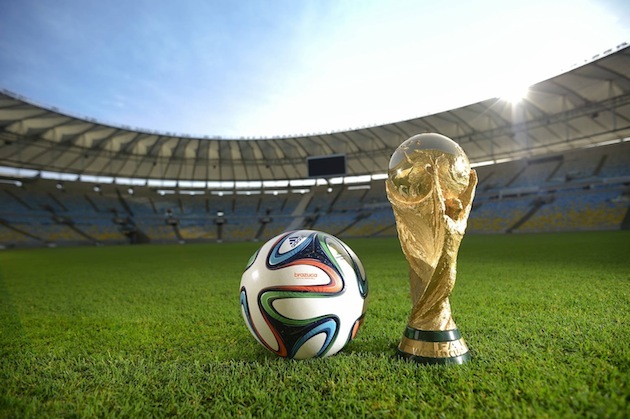 This was rumored to be an aspect of this ball that FIFA had been excited about since it would provide better goals during the World Cup and it seems to be a legitimate quality possessed by the Brazuca. There were several strikes and long balls where it did seem like it flew a little faster through the air. Perhaps this is can be attributed to the smaller shape of the ball or the odd panel shape, but once this ball starts being used in the upcoming MLS season and in the World Cup, I expect there to be several long range strikes that fly past the keeper a bit faster than if a different ball was being used. If you plan on playing with the Brazuca in colder climates, be warned that it seems to be affected more by the cold than other match balls. Other FIFA “A” approved balls still feel cushioned as you go for a header (no matter whether the ball has too much air or has gotten cold), but the Brazuca left several of us rubbing our heads after going for headers to try and ease the pain we received for our effort. In warmer weather, the problem seemed nonexistent and the typical match ball cushioning was evident when going for a header. All in all, the Brazuca is a great outing from adidas and should aid the German brand in slowly erasing the black mark from the Jabulani. It performs as a top tier match ball should while embracing new technologies and looks. Although the look of the ball might be insane, the ball responds admirably. There is nothing that should keep you from snagging one of these for yourself, although the heightened price-tag from adidas might prevent it from being as accessible as other match balls. 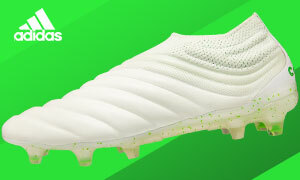 Head over to SoccerPro.com and snag one for yourself today! Bought one the day it came out. It is beautiful. MonkeyDJonas What are your thoughts on the Brazuca? Have you had a similar experience to my own? I tried it and I didn’t like it. It just feels artificial. Your comment “s different as possible from any other ball that is currently available” rings true. But why is that a good thing? And why is faster flight a good thing? I don’t understand why Adidas feels its needs to keep reinventing the soccer ball. Nike makes an outstanding ball with very nice touch. Adidas makes something ‘different’ without that touch. I’ll take Nike. I never said that either of those things were good things, especially the faster flight. It all comes down to a matter of opinion and what you are looking for with a match ball. I also prefer the current Nike match balls that are available, but wanted to give all the details about the Brazuca that I found. And CRonaldo, it always seems like adidas is very aware that a ball that looks really different and seems unlike anything on the market will make them more money. It isn’t that they feel the need to reinvent anything, but they know that a large contingent of their customers will buy anything new. Thanks for your comment! Do you have the Ordem? Do you think it is an improvement over the Incyte? @CRonaldo It doesn’t necessarily have to be a good thing CRonaldo. It’s all down to personal preference, but I feel that the review needs to have every aspect of the ball mentioned as the price for a top-tier match ball is quite high. The main reason adidas probably makes the seem so “different” is because they know that anything new will inevitably sell better as consumers always want the newest products. I can’t disagree with you when it comes to preferring Nike match balls, but everyone has a particular preference. Thanks for reading and sharing your thoughts! I used one in San Francisco, and since it was around 52 degrees, the ball felt like a rock. The cafusa ball definitely feels softer in cooler climate. Used it again in warmer climate and it was much better. 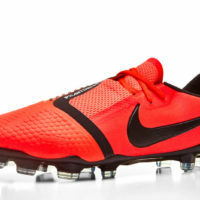 That said, I still think Nike’s line of the last 5 years is superior, as much as wish that weren’t the case.